I strongly suggest you go to a bookstore and pick up SO COLD THE RIVER, Michael Koryta’s latest novel, and read the first sentence. I assure you that you’ll be as hooked as I was — and the rest of the novel is every bit as good and imaginative as that opening line. Koryta has gifted us with literary crime and suspense novels that twist and turn into unexpected plot nooks and crannies while remaining highly believable and credible. Once again, he brings his exquisite craftsmanship to the table with SO COLD THE RIVER, though he is serving up an entirely different feast this time. Nominally a crime novel and somewhat of a mystery as well, his latest effort is primarily a tale of the supernatural. If you want to make comparisons, it’s a bit closer to Peter Straub than to Stephen King, but it’s closest of all to Koryta’s past work. Think of it as taking place in that fog-laden field that he has driven past in his other books and looked at without commenting on it. The man has a style of his own, and it really can be appreciated when he steps outside of — or expands — his zone of familiarity as he does here. And what is that, exactly? Koryta sets SO COLD THE RIVER smack dab in the middle of the real world, within the West Baden/French Lick, Indiana area and a real landmark, the West Baden Springs Hotel, a magnificent building that is breathtaking in its design. Koryta’s descriptions of this resort, along with images of the hotel you can find online, will rock your world. But this is not a return to the Overlook Hotel, transplanted to Indiana. This is where Eric Shaw, the star-crossed protagonist, stays as a guest while planning the film that will hopefully revitalize his movie-making career. Eric is a would-be filmmaker who came so close to achieving fame. When he missed the golden ring, he left Hollywood with his beautiful and supportive wife and returned to their native Chicago, full of disillusion. Now estranged from his wife, he is making what money he can producing tribute films for funeral presentations. It is while presenting one of these movies at a wake that he meets Alyssa Bradford. Campbell Bradford, Alyssa’s father-in-law, is 95 years old, a fabulously wealthy man whose past is cloaked in mystery and whose future is surely counted in weeks if not days. Alyssa retains Eric to make a tribute film about Campbell as a present for her husband. There is little that she can tell Eric about him, other than that he was from the French Lick area and had saved a bottle of the Pluto-brand mineral water that at one time had been produced in the area and was reputed to have restorative properties. Eric’s research is uphill, to say the least. There are but a few locals in the area who remember Campbell Bradford, and all of them insist the Campbell that Eric is researching could not be the same man, given that the Campbell of their memory would have been much older — and more notorious — than the millionaire whose remaining days are few and numbered. That bottle of Pluto Water, however, is behaving very strangely. The bottle itself has been cold to the touch ever since it got within spitting distance of West Baden. And, worse, Eric took a sip from the bottle. It is evident from the start that Eric isn’t quite right and may never be right again if he keeps drinking that water. Yet he can’t help himself. Eric is not without allies. He meets a levelheaded graduate student named Kellen Cage, who is in the area doing research of his own. There is also an octogenarian named Anne McKinney, a storm watcher who senses that something big is coming. That something is Josiah Bradford, the last living descendent of the original Campbell Bradford. Josiah feels he is owed, and old, long-dead and long-gone Campbell just might feel the same way. Something is coming to West Baden — and when it gets there, nothing will be the same. Those who enjoy crime novels and/or ghost stories will love SO COLD THE RIVER. Everything you could want is here in spades — romance, mystery, revenge, violence, and yes, redemption — and Koryta’s fine wordcraft and attention to detail make it even better. Set aside a night or two for it, and you will not be sorry. 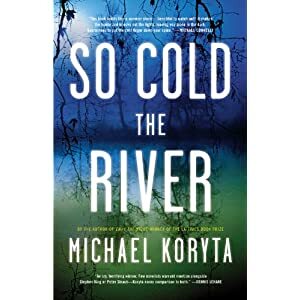 This entry was posted in Authors, Authors I Love, backbay books, Books, Fiction, Review and tagged backbay books, Fiction, ghost, little brown and company, michael koryta, murder, so cold the river, thriller on January 22, 2011 by thehungryreader.